A few years ago, hedge fund manager Ray Dalio provided a very useful template for understanding the economy. The video is above and I think it is incredibly useful as a template for understanding where we are in the economic cycle. I encourage everyone to watch the video. I think you will find it enlightening. To sum up Ray’s thesis: debt drives the economic cycle. Without debt, the economy can only grow as fast as productivity. It is debt that drives booms and recessions. Debt allows the economy to grow beyond the productivity rate, which hovers around 2% in the long run. When debt levels become too high and begin to restrain cash flows, households and business restrict spending and this causes the economy to contract. The Dalio template explains what happened in 2008 and the aftermath. In the short term (5-10 year) business cycle, borrowing increases. As borrowing increases, cash flows because increasingly tightened. When the cash flows tighten enough, a recession occurs. The Federal Reserve responds by lowering borrowing costs, restoring borrowing and creating a new economic boom. Throughout these booms and busts, debts continuously increase. In 2008, we approached the end of a long term (80 year) debt cycle, in which debts became so high and interest rates were already so low that the conventional monetary tools no longer worked. This was the beginning of a decade of deleveraging, in which businesses and households shied away from debt after such a tumultuous experience. During such a time in which new debts cannot drive the economy, the best that the economy can do is grow at its productivity rate. 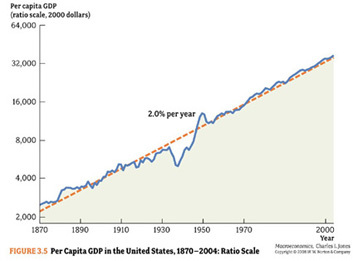 There has been a lot of head scratching in the last decade about why the economy can’t grow faster than 2%. Dalio’s template explains it. It has nothing to do with taxes, regulation, culture, etc. It is caused by the deleveraging. Without debt, the economy can’t grow faster than the productivity rate, which averages around 2%. The data supports the thesis that businesses and households are deleveraging. The S&P 500 debt to equity ratio fell to its lowest level in 30 years. Households went through a similar deleveraging process, as documented in the chart above. Households now have the lowest debt payments as a percentage of disposable income that they have had since the early 1980s. Incomes have increased, households cleaned up their debt levels and interest rates have died. Every business and every household that had a lot of debt in 2008 went through hell in the recession. The memory has not been lost. 0% interest rates and quantitative easing weren’t enough to spur borrowing, causing a lot of confusion among economists and policy makers. The cause ought to be obvious: no one wants to get burned again because the memories are fresh. This has been bad for economic growth since the crisis, but I think it improves the long term prospects of the US economy. Economist Hyman Minsky theorized that stability is destabilizing, because stable times encourage increasingly reckless lending and borrowing. We experienced this truth in 2008. If Minsky is right about stability, then the opposite must be true for instability. Instability is stabilizing. Less debt means a lower likelihood of a 2008 economic shock. A more healthy attitude about debt and borrowing might prevent a wild economic boom, but the lack of such boom times also prevents catastrophic economic shocks. We went through a similar experience in 1929, the last time we reached the end of a long term debt cycle. The difference between 1929 and 2008 was the response of the Federal Reserve. The Fed responded disastrously in 1929. The Fed turned an economic panic and recession triggered by a deleveraging into a Great Depression, as Milton Friedman proved. This time, it appears that in 2008 the Fed responded appropriately. That is why we have been able to go through a relatively tranquil deleveraging, in which debts decreased and the economy grew in a limited capacity at its productivity rate. I was fascinated by Dalio’s template of the long-term 80 year debt cycle because it matches perfectly with William Strauss and Neil Howe’s generational theory. The theory describes history in terms of 80-100 year cycles. The cycle of history also seems to match Dalio’s observations about the long-term debt cycle, in which debts continuously accumulate throughout the ups and downs of a long term cycle and then culminate in a period of deleveraging, lasting roughly a decade. Check out Strauss and Howe’s excellent book if you want to understand the debt cycle in a better historical context. Strauss and Howe also discuss a high that follows a crisis (deleveraging). When the delveraging is over, a roughly 20 year period of financial tranquility follows. Yes, there are recessions and the normal stock market bull and bear markets, but nothing of the magnitude of a 1929 or 2008. Instability is stabilizing and everyone making the decisions has fresh memories of the deleveraging. This prevents corporate managers from acting like the reckless managers of the 1990s/2000s or the 1920s. The last decade has usually been described as a slow growth period of malaise. I think this misses the mark. The seeds have been planted for a future sustainable economic boom because the paring down of debts and the memories of the crisis lowers the likelihood of an economic shock. The Fed’s actions – far from being reckless as is typically described – were exactly the monetary medicine that the economy needed. This was the medicine that Fed failed to deliver in the early 1930s. The deleveraging was inevitable in the 1930s, but we didn’t need to have a Depression. We could have had a period like the decade we just experienced. How do I use this template to influence investment decisions? Generally, I am agnostic when it comes to the macro economy. As long as I have a diversified portfolio of cheap stocks that are financially healthy, I should outperform the market over long stretches of time. The market will rise over time as long as the economy continues to expand. The slow and steady expansion of the economy is its natural impulse, as people are always looking for more productive ways to produce goods and services and the population will continuously expand. With that said, I think it is important for investors to remain cognizant of our position in the debt cycle. For instance, if debt service ratios are approaching new highs, a recession is likely to happen soon. In that environment, it makes sense to steer clear of heavily leveraged firms or firms that are heavily cyclical. If debt levels are combined with high market valuations, avoidance of market indexes may be prudent. I hope you find the Dalio template as insightful and useful as I do. PLEASE NOTE: The information provided on this site is not financial advice and I am not a financial professional. I am an amateur and the purpose of this site is to simply monitor my successes and failures.